Sean Rafferty presents a lively mix of conversation, arts news and live performance. With violinist Isabelle Faust, conductor John Eliot Gardiner and pianist Mariangela Vacatello. Sean Rafferty presents a lively mix of conversation, arts news and live performance. 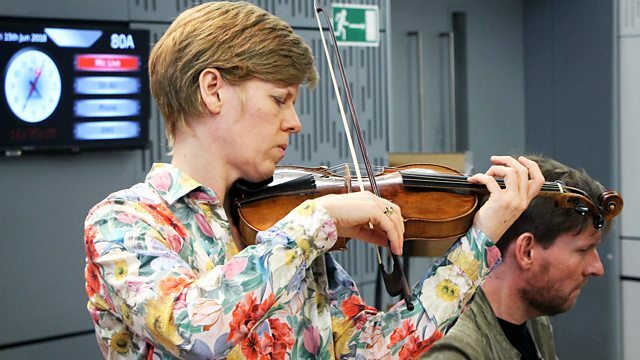 His guests include violinist Isabelle Faust, who performs live for us with Kristian Bezuidenhout ahead of their performance at LSO St Luke's. Conductor John Eliot Gardiner joins us down the line to talk about the Bach weekend at the Barbican, and pianist Mariangela Vacatello performs for us before appearing at the Matrix Arts Centre in Oxfordshire. Singer: Danielle de Niese. Orchestra: Orchestra of the Age of Enlightenment. Conductor: Charles Mackerras. The Mozart Album: Danielle de Niese. Performer: Isabelle Faust. Performer: Kristian Bezuidenhout. Performer: John Tomlinson. Music Arranger: Alex Baranowski. Orchestra: London Metropolitan Orchestra. Orchestra: Belarus State Symphony Orchestra. Conductor: Marius Stravinsky. Performer: Raphael Wallfisch. Orchestra: English Chamber Orchestra. Conductor: Geoffrey Simon. Orchestra: South-West German Chamber Orchestra Pforzheim. Conductor: Timo Handschuh. from the St Albans Organ Theatre. Performer: Alastair Ross. Choir: Monteverdi Choir. Conductor: Sir John Eliot Gardiner. Performer: Michal Biel. Singer: Jakub Józef Orlinski. Singer: Danielle de Niese. Singer: Bryn Terfel. Orchestra: Orchestra of the Age of Enlightenment. Conductor: Charles Mackerras.